This is my version of Tom Kha Soup, one of the most popular dishes of Thailand’s cuisine. Slightly spicy, sour and made with ingredients that you can easily find! Serve with white or jasmine rice for a complete meal. Out of all the cuisines that I attempt to cook at home, I find the Asian ones the most intimidating. We go out to eat at least once a week, and I’d say that 50% of the time is to a Thai or Chinese restaurant! One of the reasons is because we love it. And the other is because I don’t usually cook those dishes at home! But 2019 is a new year and I’m determined to be more courageous! So here am I, sharing this delicious Tom Kha Soup I made. It was a hit with my family, especially my husband! I hope it inspires you to experiment Thai cuisine at home! Life can be much more delicious when we overcome fear and step out of our comfort zone! Let’s start by addressing the inauthenticity of my recipe! One of the reasons why people don’t cook certain cuisines at home is because they can’t find the necessary ingredients. And I totally understand that! Unless you live in a multicultural place, like New York City, finding an Asian Market can be challenging. 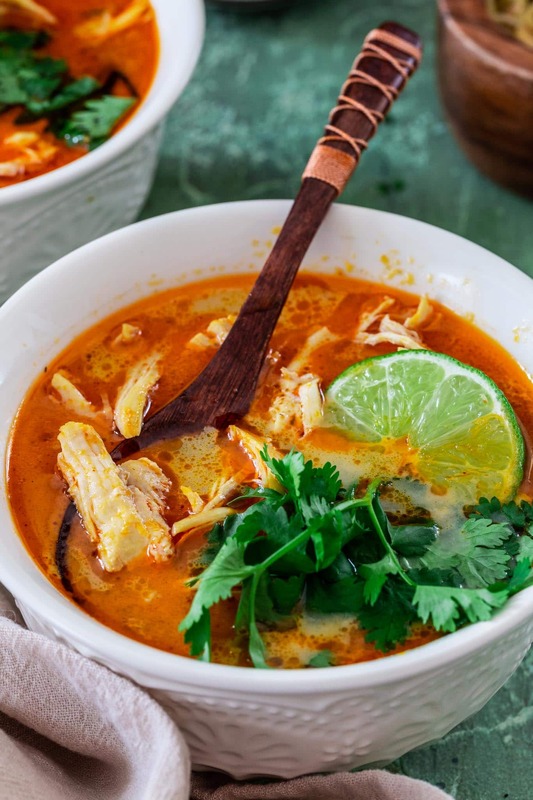 So I wanted to share a recipe for Thai Chicken and Coconut Soup that would be accessible but still taste like the real deal! And if you keep reading below, I’ll mention the authentic ingredients in case you can find them! I read recently that Tom Kha Gai used to be a simple dish of chicken, galangal and coconut milk. Other ingredients were added with time, as Thai food started intersecting with neighboring countries. Galangal – If you’re going for authentic, this is an important ingredient. After all, it’s the “kha” in Tom Kha. It is also really hard to find, unless you go to an Asian Market, so I am subbing it for ginger in my recipe. Coconut Milk – Easy to find and, in my opinion, what makes this soup so delicious! Lemon Grass – That can be difficult to find. I was able to find it, jarred, at Whole Foods. Lime Leaves – Same as above. 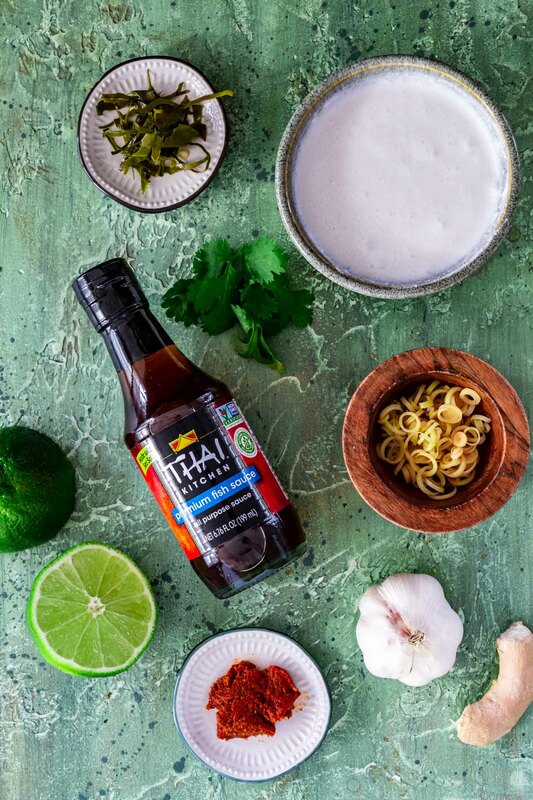 Fish Sauce – Correct me if I’m wrong, but I think these days you can find fish sauce at any major grocery store. What’s the difference between galangal and ginger? They look very similar, so you might think they taste the same, which is not the case. Galangal (pronounced guh-lang-guh) has a citrusy scent and sharp piney flavor, while ginger is fresh and, although pungent, not as strong as galangal. Unlike ginger, which has a softer flesh that can be grated, galangal is hard and must be sliced. If you can find it to use in this soup, make sure to remove the slices at the end, before serving. Galangal is a fibrous root and therefore tough and inedible. Lemongrass is a stiff grass native to India, widely used as a herb in Asian Cuisine, adding a citrusy flavor to a variety of dishes, from curries to cold drinks. It has a lemony aroma and lemony flavor and can be dried and powdered, or used fresh. Depending on where you live, you might find it in the produce section of your supermarket, sometimes already trimmed. In my case, I could only find it jarred, already sliced, at the Asian aisle of Whole Foods. You can sometimes find them in the freezer section too. If you find them fresh, look for firm stalks. If they are soft that means they’re too old! The lower stalk should be almost white in color (more like a pale yellow) and the upper stalks are green. Stay away if the outer leaves are brown or crusty. To prepare, cut off the lower bulb and remove the tough outer leaves. Trim off the spiky tops and bases, cut them into 2 to 3-inch lengths and crush the stalks with the side of a knife, releasing their lemon flavor. From there, you would just add the lemon grass pieces to the soup and remove them at the end, as they are very fibrous, just like galangal. 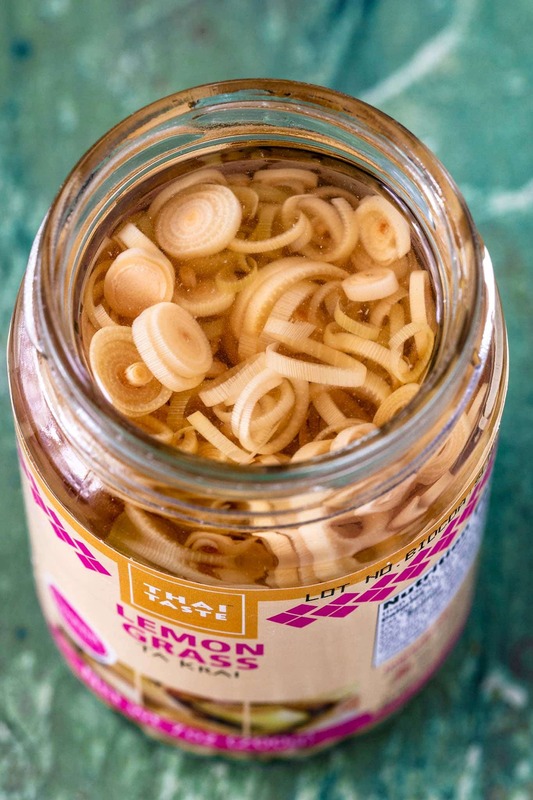 I honestly like to use the jar version because it’s ready to be used and, since they are sliced so thin, I don’t have to worry about discarding them at the end. If you can’t find them whatsoever, a good enough substitute would be lemon zest. Not quite the same, but I’d prefer you use that instead of giving up on the soup altogether! Makrut Lime Leaves are commonly used in Thai cuisine, especially in soups, curries, sauces and fish dishes. They are distinctly aromatic and have an unique citrus flavor that are part of so many Thai dishes. 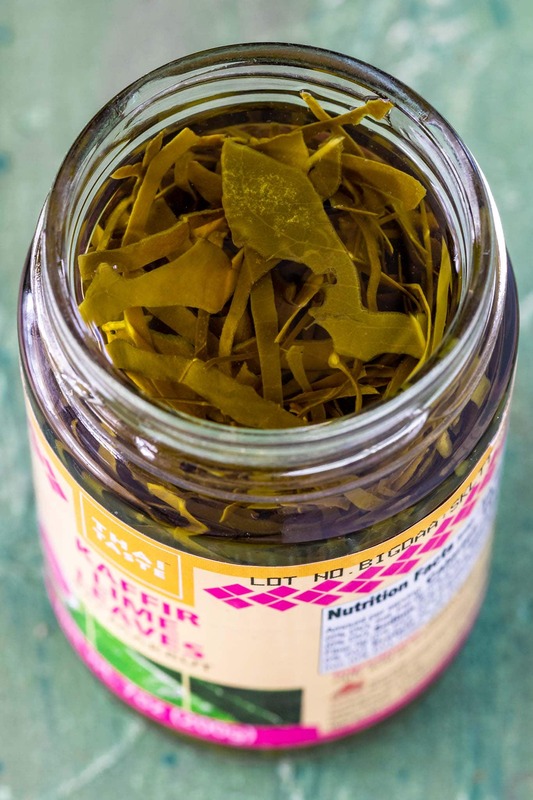 They are used whole or thinly sliced, just like bay leaves, and removed before eating. Just like galangal and lemongrass, they can be hard to find if you don’t have an Asian market near you. If you don’t find them fresh, check the frozen aisle. And if you can’t find them there, then you will probably find the jarred kind at the Asian aisle of your supermarket. 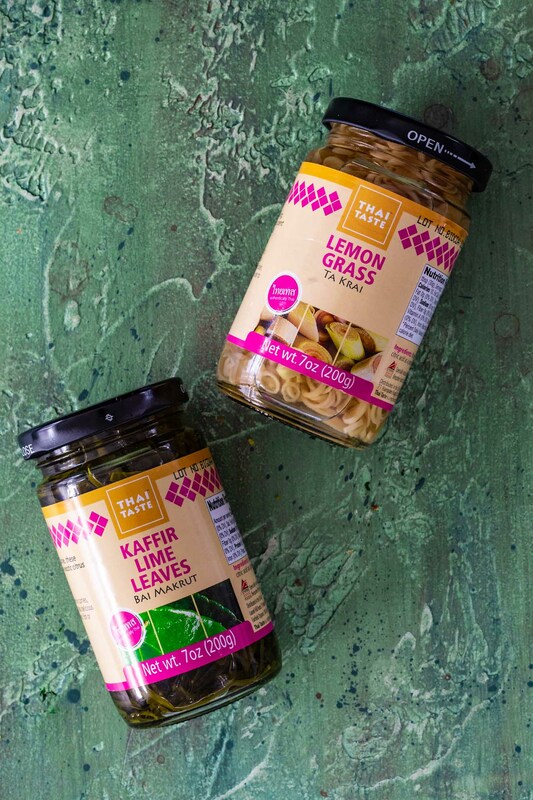 Chances are you will find them under the name “Kaffir Lime Leaves”. I recently learned that that’s a racist and offensive name. I’m not sure why, but since it can be hurtful to some people, I will refrain from using that designation. If you can’t find them at all, lime peel can be substituted in a pinch! Can I freeze Tom Kha Soup? 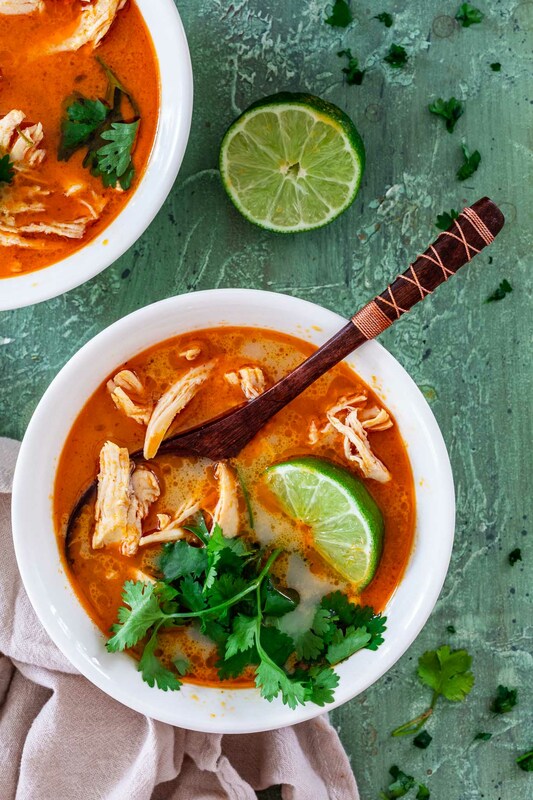 Unlike dairy, coconut milk freezes really well, so this Thai Coconut Chicken Soup can be frozen for up to 3 months. So go ahead and make a double batch! You will be glad to have this in your freezer whenever you are craving something comforting. This soup is often served garnished with cilantro and with steamed rice and extra lime wedges on the side. Rice noodles, although not authentic here, would also make a great addition! You will find some versions of this soup with mushrooms, usually straw mushrooms. And sometimes made with shrimp instead of chicken. The soup can also be made vegan by omitting or substituting the chicken and using vegan fish sauce instead (you can find it on Amazon or you can make it yourself!). So what do you say? Are you inspired to try some new things this year? I think this aromatic soup is a great way to start! And if you are looking for other Thai dishes to cook at home, my Massaman Curry Chicken is also delicious and easy. It’s my favorite Thai dish and I love making (and eating) it! Combine the chicken breasts with the juice of half a lime, the fish sauce and a pinch of salt in a bowl. Reserve. In a large pot (or dutch oven), heat the coconut oil, over medium heat, and, once melted and shimmering, add the garlic and ginger, cooking until softened and fragrant. Add the lemon grass and curry paste and cook for about a minute to release the fragrances. If using galangal root, you can add it now. Add the chicken broth, brown sugar, coconut milk and lime leaves. Bring to a low boil, add the chicken and lower the heat to a simmer. Simmer for 15-20 minutes or until the chicken is tender. Shred the chicken and return it to the soup. Remove the soup from the heat and discard the lime leaves, lemongrass (if using fresh) and galangal root. Taste for seasoning and adjust salt if necessary. 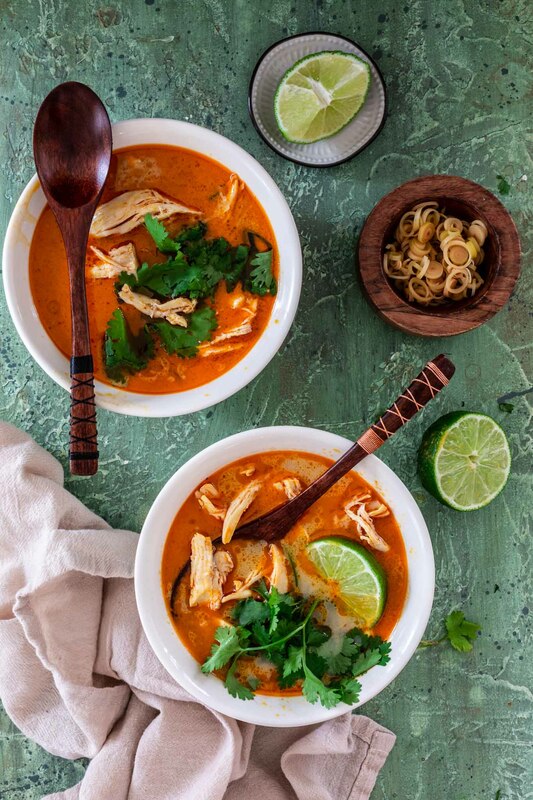 Squeeze the remaining half lime, ladle the soup into bowls and garnish with cilantro. Serve with lime wedges and steamed white or jasmine rice. 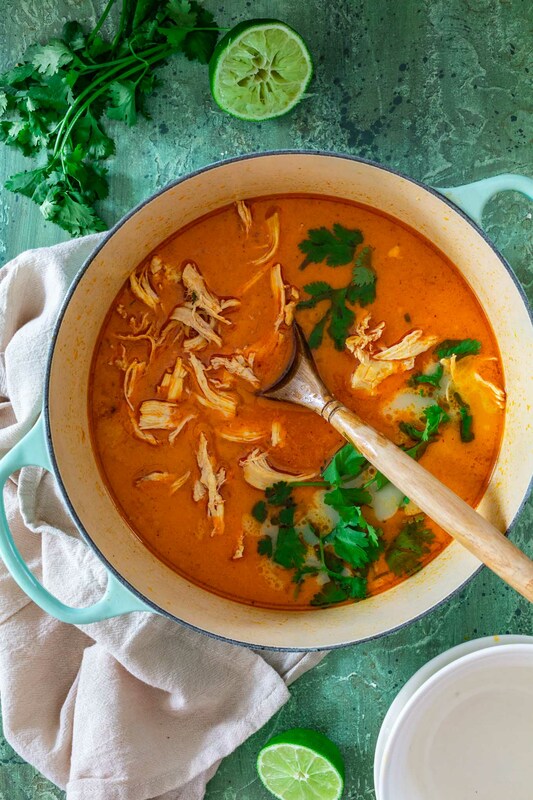 This soup is not too spicy, but if you want to go even milder, you can use less curry paste. You can also substitute 1-2 cups of chicken broth for another can of coconut milk. That will also make it lighter in color and creamier!